UK: Dong Energy, in partnership with Oxford University and the Carbon Trust's offshore wind accelerator programme, has completed testing of monopile designs with a view to reduce costs. The Pile Soil Analysis (PISA) testing programme has installed 28 scale-model monopiles ranging in size to test the current design methods for offshore monopiles. The project's technical manager, Alastair Muir Wood, said initial results from the campaign show "traditional design methods in these soils are very conservative". Testing was carried out at two onshore sites with different soil types, one site near Cowden, north-east England, with a stiff clay soil and one near Dunkirk, northern France, with a dense sand ground. Dong said the two test sites replicated soil types found in the North Sea. A 35% reduction in steel could be made as a result of the testing, using reduced metal thickness and narrower or shorter monopiles in these soil types. This would make monopile foundations cheaper. Further data analysis is required and results are expected to be shared with the projects partners by January 2016. 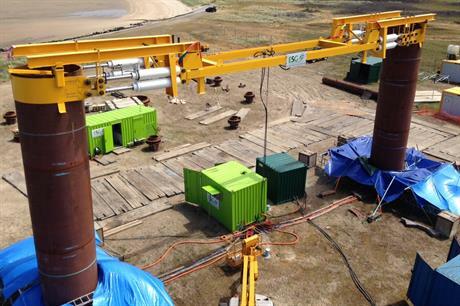 Dong Energy's research and development project manager Jesper Skov Gretlund said: "If the thickness or length of the steel piles can be reduced by even a small fraction, the saving in cost is quite considerable since smaller construction vessels can be used and larger turbines constructed."